Whether you gift this high-quality, personalized framed artwork for holidays, birthdays or anniversaries, you'll nail your gift-giving tasks this year. The die-hard baseball fan in your life with a soft spot for their family will appreciate your thoughtful gift of our Personalized Family Cheer St. Louis Cardinals Wall Art. It's easy to customize: Just note the family's name up to 12 characters and we will do the rest! 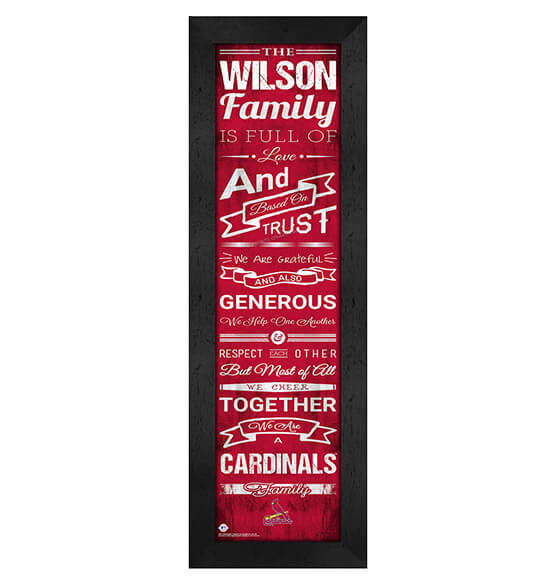 Featuring the Cards' team colors and logo, this vertical-hanging fine sports decor highlights the love and devotion of family in a vintage-style script. This piece comes ready to hang with an included sawtooth hanger on the back.